Haiti with its capital Port-au-Prince is located in North America (Caribbean, western one-third of the island of Hispaniola). It covers some 27,751 square kilometers (slightly smaller than Maryland) with a population of 10,646,700. 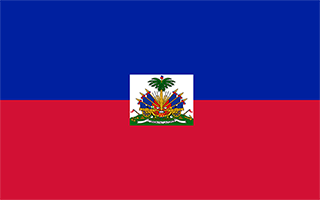 Haitian and French are some of the languages spoken by the majority in Haiti. Did you know that Dominican Republic is the only bordering country. Haiti is a Caribbean country that occupies the western one-third of the island of Hispaniola. The eastern two-thirds of Hispaniola is occupied by the Dominican Republic. Haiti is a country with a troubled past, and its future still remains uncertain. Decades of poverty, environmental degradation, violence, instability, dictatorship, and coups have left it the poorest nation in the western hemisphere. The terrain is mostly rough and mountainous. The average density of population is about 384 per km². The climate in Haiti can be described as tropical with semiarid where mountains in east cut off trade winds. Possible natural disasters include lies in the middle of the hurricane belt and subject to severe storms from June to October, occasional flooding and earthquakes and periodic droughts. To reach someone Haiti dial +509 prior to a number. The local cellular networks are operated on 850 MHz, 900 MHz, 1800 MHz, 3G, 4G. Websites typically end with the top level domain ".ht". If you want to bring electric appliances (e.g. battery chaarger), keep in min the local 110 V - 60 Hz (plugs: A, B). The sign for the locally used currency Gourde is HTG. Two equal horizontal bands of blue (top) and red with a centered white rectangle bearing the coat of arms, which contains a palm tree flanked by flags and two cannons above a scroll bearing the motto L'UNION FAIT LA FORCE (Union Makes Strength); the colors are taken from the French Tricolor and represent the union of blacks and mulattoes. The native Taino - who inhabited the island of Hispaniola when it was discovered by Christopher COLUMBUS in 1492 - were virtually annihilated by Spanish settlers within 25 years. In the early 17th century, the French established a presence on Hispaniola. In 1697, Spain ceded to the French the western third of the island, which later became Haiti. The French colony, based on forestry and sugar-related industries, became one of the wealthiest in the Caribbean but only through the heavy importation of African slaves and considerable environmental degradation. In the late 18th century, Haiti's nearly half million slaves revolted under Toussaint L'OUVERTURE. After a prolonged struggle, Haiti became the first post-colonial black-led nation in the world, declaring its independence in 1804. Currently the poorest country in the Western Hemisphere, Haiti has experienced political instability for most of its history. A massive magnitude 7.0 earthquake struck Haiti in January 2010 with an epicenter about 25 km (15 mi) west of the capital, Port-au-Prince. Estimates are that over 300,000 people were killed and some 1.5 million left homeless. The earthquake was assessed as the worst in this region over the last 200 years. President Michel MARTELLY resigned in February 2016 and was replaced by Interim President Jocelerme PRIVERT. President-elect Jovenel MOISE won the November 2016 elections and assumed office in February 2017.